This story is about a personal experience from long ago that I want to share with you for this holiday season. It felt like a miracle at the time – and, even after all these years, it still does. All kids deserve wonder and joy! I had read about poverty. I had never experienced it. In 1971, from the highway, the shabby shacks of the Winnebago and Omaha Indian Reservations looked abandoned. No yards. Broken windows patched with tape. Dirt roads that rain turned into rivers of mud. As a VISTA Volunteer, I was to join the people living here for a year. Even within that short time, I might have been sucked into the despair living close to poverty can bring. Instead, my hope and faith in people grew thanks to the strong connections of these tribal communities and the help of a very different community nearby. With a deep sense of purpose and passion, I loved my work with the Winnegego and Omaha peoples. Although they lacked material riches, they had a spiritual wealth of traditions and a healing wealth of connection and kindness to help each person through the bad times. I loved their humor and warmth. I learned from the wisdom of their culture, this oppressed people who were facing trials that reminded me of stories of my own impoverished family’s struggle for survival in Eastern Europe during World War I. Not twenty minutes away from the Reservation by car, across the state line into Iowa, the middle-class neighborhoods of Sioux City seemed like another world. Comfortable houses. Prosperous businesses. Well-stocked stores. While exploring Sioux City, I met Al Gordon, Rabbi of the Mount Sinai Temple. “Irene Regelson,” he mused, seeming to ponder over the 22-year-old woman sitting in front of him. “A young Jewish girl like you, actually living on that Reservation!” He paused, looking thoughtfully at the books lining the walls of his office. “I’d like you to meet my wife, Lenore. Our daughter is about your age.” Happily, I accepted their invitation to dinner. Lenore Gordon was quick in her movements, compassionate, and expressive. “Your mother must be worried sick about you, living way OUT THERE!” she exclaimed, obviously thinking of her own feelings if her daughter were to do something she saw as so risky. We had a marvelous evening, and the Gordons made me feel like a member of their family. “Anything happens, anything you need, just remember we’re here,” Lenore said anxiously, while cramming a bag with goodies for me to take home. There is a joy in abandoning oneself to actions that you believe will make a difference. My days were filled with setting up community meetings and writing proposals to begin programs — tutoring, welfare rights, senior centers, alcoholism treatment, and infant nutrition. I felt appreciated for my energy and skills and taken care of when I ran into trouble. People planned for my tendency to get lost on the back roads or stuck in the snow, and somehow someone always appeared even in the remotest of places to come to my rescue. At night, I fell into bed exhausted or escaped sometimes to visit the Gordons. 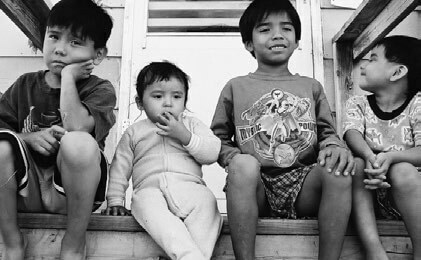 The alcoholism, hunger, and lack of hope that crushed the lives of so many people on the Reservation sometimes also crushed my spirit. Each time I left my tiny apartment for the Gordon’s spacious home, it was luxury. Home-made dinners, in Lenore’s opinion, were practically all that kept me from starvation. These visits gave me back my courage. Those kind people took care of me when I was sick, comforted me when I was sad, and respected my work, even as they wondered what drove me to do it. But this balance I had found broke down in December when I watched the Winnebago and Omaha children watching the flickering television at the community center and the parade of Christmas commercials. These children had always amazed me with their lack of selfishness. If a group went to the store for a treat, they’d each put their money into one child’s small hand. One would give a quarter, another a dime, another a couple of pennies, or maybe nothing at all. It didn’t matter. They’d buy their candy or ice cream together and share it equally, regardless of who had contributed what. As those kids watched, an ache started to grow in my heart. Memories of my own holidays, of a loving, stable family, of having every material thing I ever really wanted or needed began to haunt me. The parents of most of these children had no jobs — there were no jobs to have. They were living in households surviving by the barest of margins. Many had no heat, so whole families were sleeping together in the same bed to keep warm during those freezing Nebraska nights. The older children knew better than to hope for more than a token amount of Christmas glitter to enter their lives. There would, of course, be something nice from their churches, but nothing special just for them. Nothing like what they saw on television. “We don’t need it,” they sighed. “We’ve got something better.” And the closer it got to Christmas, the sadder those sighs sounded. All kids deserve to have wonder and joy – and giving these children their own “Santa experience” was important to me. My family’s heritage is Jewish, and my parents did not practice any formal religion. Even so, they decided that, like all our neighbors, their children would have a Christmas tree and Santa Claus. Driven by my childhood love of Santa Claus and the Spirit of Giving, I took my beat-up government surplus pickup truck and headed off to the bright lights of Sioux City. Armed only with energy and optimism, my plan was to visit the large department stores. Surely the owners would be glad to share their plenty once they heard my sad story about the Winnebago and Omaha children who were not going to have a visit from Santa without their help. The streets were filled with wind, snow, and skidding cars. The stores were jammed with grumpy shoppers, weary salespeople, and tinsel decorations. The store managers were frankly incredulous at my request. “Are you kidding? I gave more than we could afford weeks ago,” said one. “We only give to established organizations,” sniffed another. “Is there an endless supply of you do-gooders, or what?” groaned a third. “Business is really bad this year, honey,” was the kindest remark I heard. After five stores, I grew discouraged. And by the time I’d approached eleven stores without one success, my heart was breaking. I could not bear the thought of returning empty-handed to the Reservation. The telephone booth felt like a deep freeze. The dime kept slipping from my numb fingers before I managed to jam it into the slot and dial. Twenty minutes later, Lenore sounded satisfied with whatever she’d done, saying, “I called several businesses from our Temple who will be glad to help.” She gave me names, addresses, and directions and sent me on my way. Hesitantly, I entered the first store. “Max, it’s the girl to pick up the stuff for the kids on the Reservation,” the cashier announced. Max beamed as he loaded cases of apples and oranges into my pickup truck. “Got kids of my own,” he said, adding a few names of stores to Lenore’s list. Very quickly, the trickle of generosity grew into a flood. I left store after store, carrying boxes of toys and candy, nuts and fruit. I deposited one truckload at the Community Center and drove back to Sioux City for another. And another. By the end of the day, a small army of volunteers was preparing gift boxes for every needy family on both Reservations. The magic of that “Christmas Miracle” has never left me. I learned that the best of any religion and culture is about community, generosity, compassion, and hope. And that, once we look below the surface, our differences are far less important than the ways that we are the same.